Julington Creek Plantation Golf Community in Jacksonville. 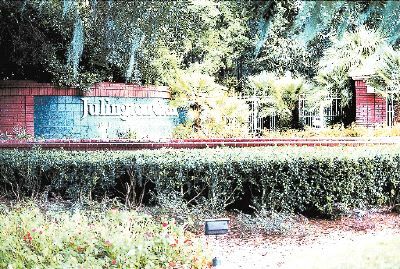 Welcome home to Julington Creek Plantation, a subdivision encompassing 4,119 acres and more than 12 distinctive neighborhoods with 5,400 completed home sites and room for a total of 6,200 home sites. The community is among the top 10 master-planned communities in Florida offering recreational facilities and a large selection of homes ranging in price from the $200's to over $1 million. Julington Creek Plantation is located in the northwest corner of St. Johns County just south of Julington Creek. The community extends east from Florida 13 approximately 3.5 miles on both sides of Race Track Road. Affordable townhomes by D.R. Horton. Elegant townhomes by Mercedes Homes. Entrance off Racetrack Road near new Durbin Creek Elementary School. 60' home sites. Small private community by D.R. Horton. Located near regional park and the Fruit Cove School. 60' home sites. The builder is Providence Homes. Home sites are 50' wide and many border a large lake or a nature preserve. The builder is D.R. Horton. Heritage Oaks offers 70' home sites and Manor Oaks 60' home sites. Many border a lake or a nature preserve. The builders are Centex Homes and D.R. Horton. Located in the gated neighborhood of Plantation Oaks. Plantation Oaks will have its own recreation area in addition to Julington Creek Plantation Aquatic Center. The builder is D.R. Horton. Located in a wooded enclave, home sites in this pristine setting are 70' wide by Providence Homes. The natural setting is ideal for residents to enjoy the abundant wild and quiet seclusion. New homes by D.R. Horton. Surrounded by wetlands and ponds, Eastwood is near the new Fruit Cove School and the soccer fields. The builder is Panitz Signature Homes. 90' home sites in a beautiful natural setting. Builders are David Weekley Homes, Kicklighter Custom Homes, and Providence Homes. Stunning environmental beauty and secluded home sites. Buiders are Kicklighter Custom Homes and Providence Homes. Lush forest land with cozy neighborhood feel. Buider is North Florida Builders. Near the aquatic center, The Champions Golf Course and bordered by a sparkling lake or a conservation area. The builder is Centex Homes. A new gated community with its own recreation area and bordered by lakes or wetlands. Builders are ICI Homes, North Florida Builders, Richard R. Dostie, New Homes Collection, and Sid Higginbotham Builder. For nature lovers and boaters, home sites in this beautiful neighborhood front the Durbin Creek Waterway. The water is navigable with depths from 15 to 25 feet. The builders are J.L. Smith Construction and Kicklighter Custom Homes. The homebuilders of Julington Creek Plantation are some of Florida's finest, and they've built their reputations over the years by giving buyers selection, design innovation, quality and value. The builders include Atlantic Builders, Beazer Homes, Centex Homes, D.R. Horton Homes, D.S. Ware Homes, David Weekley Homes, Higginbotham Builders, ICI Homes, J.L. Smith Construction, Kicklighter Custom Homes, North Florida Builders, Mercedes Homes, Providence Homes, Richard Dostie, River City Homes, SEDA Construction. Ask me about what each offers in Julington Creek Plantation. For a private tour and showing, please call (904) 307-8998.